Every Accountant using Acumatica had a big reason to be thankful last week, and not only those in the United States who celebrated Thanksgiving. They could be thankful for the launch of Velixo Reports, an open source financial report writer for Microsoft Excel that is FREE (at least at this point). That means you, your friends, your dog, your Grandmother, and your Grandmother’s friends can download and install Velixo Reports without paying a dime, a cent, a farthing, or a pfennig. What is Velixo Reports? Here’s a sneak peak. But, before we answer the question further, it’s important to know something. 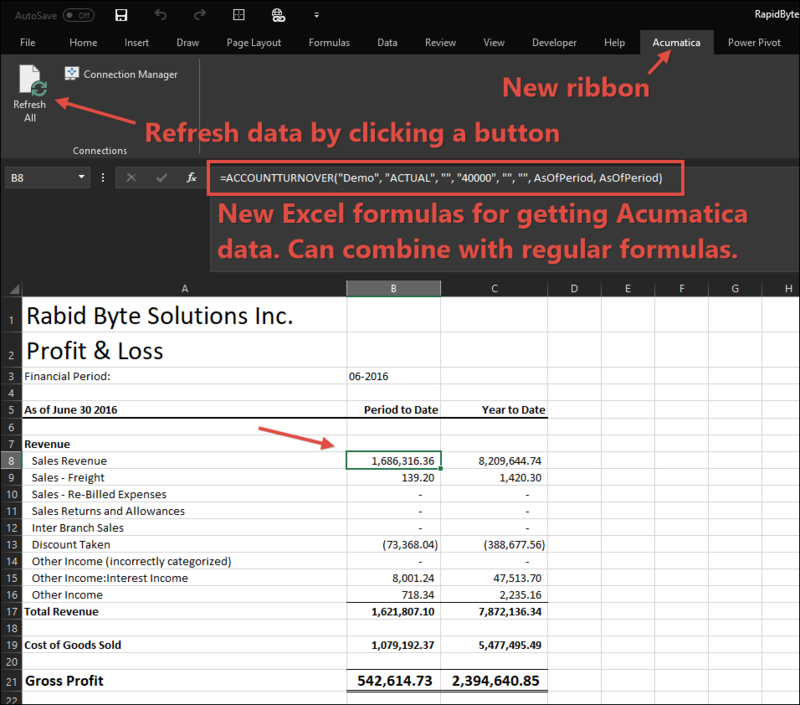 You know that Acumatica application that you’re using? Well, Gabriel Michaud had a lot to do with making it what it is today when he worked as Director of Product Manager for over 2 years at Acumatica. He became a manager. Whether it was “Director” or “Manager” in his title, he acted as a manager with people reporting to him when he worked at Acumatica. When I worked at Acumatica, rumor had it that Gabriel coded the prototype for the Print, Pack, Ship customization (click here) in two days. If that’s true, I would speculate that it was a rare two days for that “manager” to block out distractions and focus on writing some code. So, you can imagine how happy I was when I saw this post from Gabriel, breaking a six month silence on why he left Acumatica and what he plans to do next (click here). When I read that post, I got the impression that Gabriel is going to be writing more code, and that’s a good thing, at least as far as I see it. First, to read about why Gabriel launched Velixo Reports as an open source project, free for everyone (including your Grandmother), click here. The phrase that stands out to me from that post is, “give back to the community that helped me grow so much over the past few years” (I second that sentiment strongly regarding why I blog with posts like this one). Also, note that “open source” doesn’t always mean free and I wouldn’t be surprised if we see some premium functionality come to Velixo Reports in the future. Do you know Analytical Report Manager (ARM) in Acumatica? It’s the financial report writer in Acumatica. ARM is a tool that you use inside of Acumatica and it’s very similar to the old FRx in Great Plains (Dynamics GP), Solomon (Dynamics SL), and Sage. You build Row Sets and Columns Sets (optionally Unit Sets) to make a report. ARM is best used for financial reports like an Income Statement, a Balance Sheet, or a Cash Flow Statement. But, it’s funny, when you look at people using ARM, many of them do what most Accountants do: They export the generated report to Excel. And it begs the question: Why not just build the report in Excel to begin with? Hmmm, that’s a great question and it’s a question that has been answered by many financial report writer products over the years. They are built as Excel Add-ins which means that they are native to Excel so you get to leverage all of the great Excel functionality that you know and love. But none of those financial report writer products are designed specifically for Acumatica to take advantage of the modern technology platform that Acumatica offers. Velixo Reports is a financial report writer in Excel that is designed specifically for Acumatica. 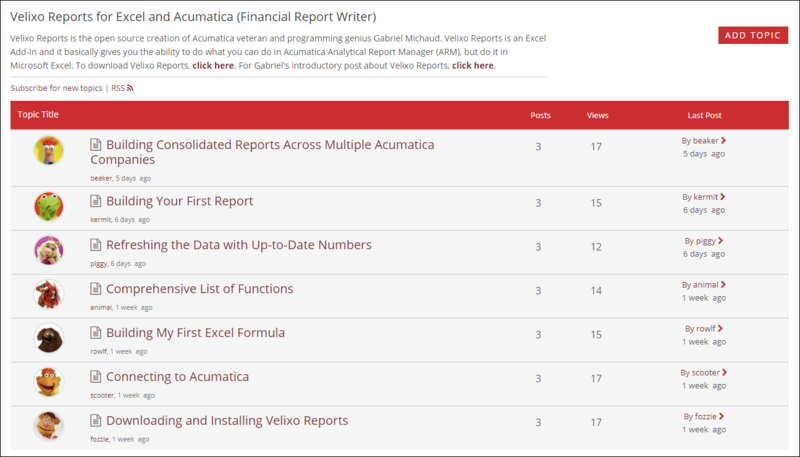 So, if you are using Acumatica and you have anything to do with creating financial reports, you have to try Velixo Reports. And you can checkout Gabriel’s post introducing Velixo Reports (click here) which gives more technical details, including how to download it..
Also, I created a forum in AUG Forums (click here), with Gabriel’s blessing, for everyone who is using Velixo Reports. Click the picture below to ask questions about Velixo Reports, share information about Velixo Reports, or just to drop a note of “thanks” to Gabriel for gifting us with such a cool product. You can also use the forum above to make feature requests like the ability to drill down, the ability to auto expand a range of GL Accounts into individual GL Accounts, the ability to report on the Project Accounting ledger like you can do in ARM, etc. Last of all, thanks to Gabriel for coming back onto the Acumatica scene with such a bang. I personally am looking forward to see what other cool “velixo” things Gabriel creates for Acumatica in the future.